Steven Simmons is a long-time fan of the Neighborhood and has been a regular reader of the Neighborhood Archive for quite some time. He is also a frequent contributor to the NA Message Board. Learn a little more about Steven in the current Neighbor Profile. 1. When / how did you become a fan of Mister Rogers' Neighborhood? It’s hard to say how old I was when I started watching Mister Rogers. But I do know that I was a fan of PBS programs like The Puzzle Place, Barney & Friends, Sesame Street, Teletubbies, and I think Mister Rogers just came with the station. At first, I would really watch the program for the Neighborhood of Make Believe segments. I don’t know if the Trolley is what got me interested, but I do know that it was something I looked forward to seeing. But as I got older, and I started to understand what Mister Rogers was saying, I started to really know that what he was saying was true. No one told him how to act or what to say, he just said what was in his heart and what he felt was right. 2. What is your favorite Neighborhood song? Why? Only one favorite song from the Neighborhood? I guess one song I enjoyed hearing as a child was It's You I Like, probably because I was a fan of slow ballad type of songs. As I got older, I heard songs like When the Day Turns Into Night, A Lonely Kind of Thing, and Love is People, and they became favorites as well. I just enjoy listening to that type of music, even to this day. 3. Person or puppet, who is your favorite Neighborhood character and why? 4. What is your favorite Neighborhood moment from any episodes you recall? There are too many moments for me to think of just one. One thing I do recall was when Mister Rogers would show some behind the scenes shots. The first time I saw this was Episode 1546. When Mister Rogers actually stepped off the set, and introduced Johnny Costa, Bob Rawsthorne, and Carl McVicker. Another week I thought was interesting was “Fast & Slow,” and “Then & Now,” maybe because they were the only plots that made the Neighborhood Trolley the subject. Being a child, like many others who watched this, I always loved it when Mister Rogers would being the Trolley out, and also when he used the Model Neighborhood of Make-Believe. I actually made my own models of the places in Make-Believe. 5. 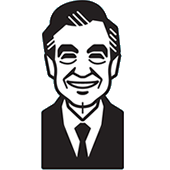 What is one main lesson you have learned from Mister Rogers' Neighborhood? Would you like to be featured in a Neighbor Profile? Drop me a line with your answers to these same questions and a photo of yourself.